All of the stars move. The motion is very slow, so it is difficult to detect. When you look at a star in the sky you can define a direction and a plane. A line joining your eyes and the star defines a direction which we call the line-of-sight. The plane perpendicular to the line-of-sight is called the plane of the sky. The star will be moving in a direction which is not (in general) either the line-of-sight or the plane of the sky. 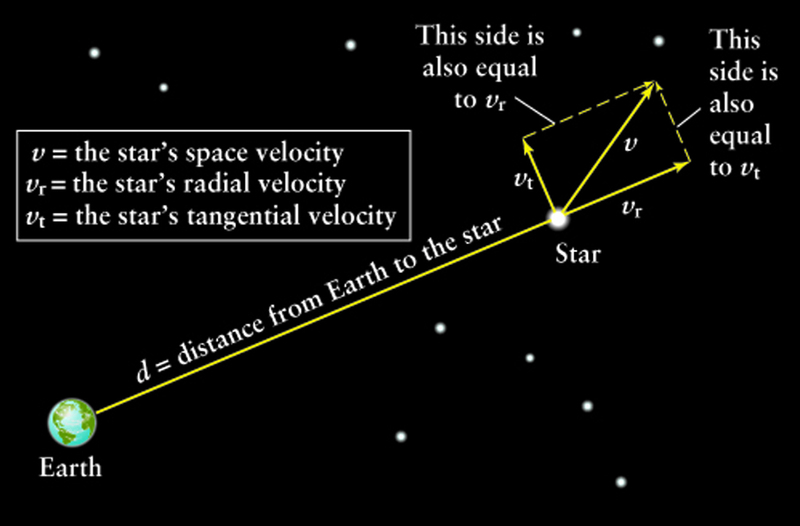 The velocity vector for one example star is shown on the diagram below. The vector V is the direction that the star is moving. Chapter 17 p 436. Box 17-1. Any vector can be broken down into component directions. 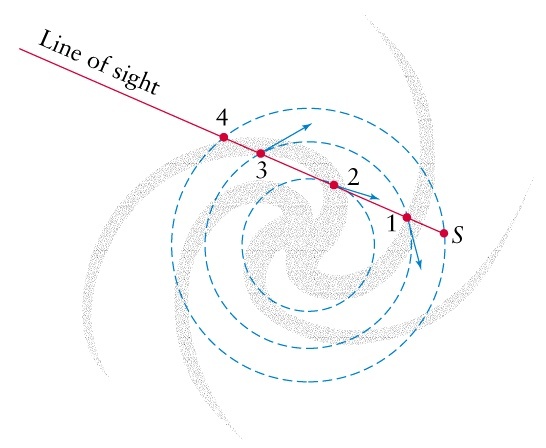 The component of the motion in the line of sight is marked Vr on the diagram. The component of the motion in the plane of the sky is marked Vt. The component of the velocity in the plane of the sky means that the position in the sky of the star changes. This motion is called proper motion. Usually term proper velicty refers to angular velocity μ across the sky. The proper motion of stars causes the constellations to change their shape. Measure proper motion by measuring the angular change in position of the star over some period of time. In the 1920's, two astronomers, Jan Oort and Bertil Linblad measured the velocities of stars near the Sun. In our solar system, the best explanation for the motion of the planets is that all the planets and the Earth all orbit the Sun. Oort and Linblad came to similar conclusions: they found that the best explanation for the motion of the stars is that the stars and our Sun all orbit around the galactic centre. The found that the galactic centre is at least a thousand parsec away from the Sun. The point that the stars seem to be orbiting about is the same point which Shapley found to be the centre of the galaxy. 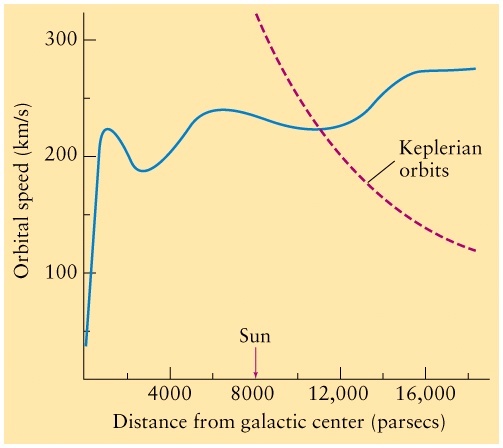 Today's accepted value for the distance between the centre of the galaxy and the Sun is 8 kpc, although there could be about 10% error in this measurement. The motion of the stars is differential rotation: the stars closer to the centre have a shorter orbital period than the stars further out. Through a little bit of trigonometry, it's possible to calculate the motion of the Sun around the galactic centre by observing other stars' motion relative to us. P = orbital period of the star. If R = 8.0 kpc, we can calculate the Sun's orbital period. P = 2 π R/V = 2 π 8.0 x 3.086 x 1016 km/(220 km/s) = 7.1 x 1015 s = 2.2 x 108 years. The Sun takes 220 million years to make one full orbit. The Sun is 4.5 billion years old. Number of orbits = 4.5 x 109 / 2.4 x 108 = 19 orbits. The motion of the Sun is approximately a circle around the galactic centre. There is a small deviation from this motion which is called peculiar velocity. The Sun's peculiar velocity is 20 km/s at an angle of about 45 degrees from the galactic centre towards the constellation Hercules. The motion of stars in the range of 1 kpc to 16 kpc from the galactic centre has been measured. The stars move approximately on circular orbits about the galactic centre along with small peculiar velocities. For most of the stars, the velocities range between 200 km/s to 250 km/s. The plot of velocity versus distance from the centre of the galaxy is called a rotation curve. 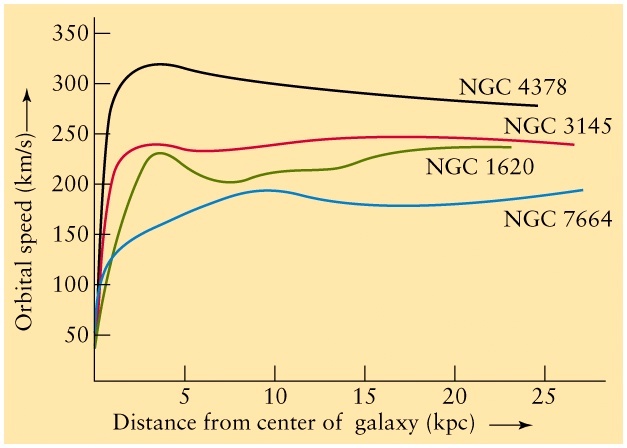 The most important feature of the rotation curve is that the velocity of stars far away from the galactic centre stays at a large value near 220 km/s. This is not what was expected, because there is almost no stars at 16kpc, where we still see 220 km/s rotational velocity. When we look at a galaxy we see most of its light coming from the central region. If most of the mass of the galaxy is concentrated in the centre, then we would expect that stars further from the centre would move at a slower velocity than stars closer to the centre. For example, in the solar system, most of the mass of the solar system is concentrated in the Sun. The velocities of planets decreases outwards. 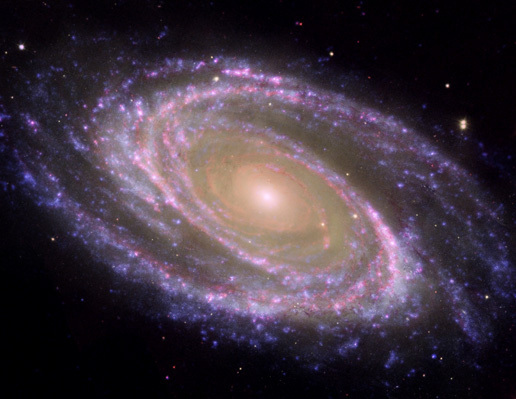 In spiral galaxies the velocities of stars far from the centre are much faster than expected. Normally circular motion is governed by a balance between gravity (pulling the star towards the galactic centre) and an effective centrifugal force (pulling the star outwards). The faster a star moves the stronger the centrifugal force. If we count up all the stars and estimate the mass of the galaxy, the force of gravity is not large enough to balance the centrifugal force associated with these fast stars. We would expect these stars to be ripped out of the galaxy. But the stars are in stable circular orbits! 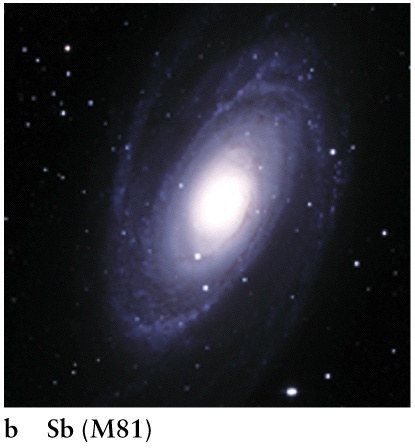 This suggests that there is more mass in the galaxy than what we can see. We call this mass dark matter since we can't see it. 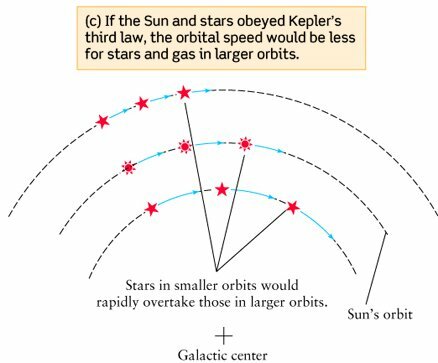 We can estimate the mass of the Milky Way by using Kepler's laws of motion. Kepler's laws are valid anytime two massive objects move around a common centre of mass. In a system like a galaxy, the Sun only feels the gravitational attraction from the parts of the galaxy which are closer to the centre than the Sun is. The gravitational attraction between the Sun and the rest of the galaxy is as though the inner part of the galaxy were compressed to a point at the centre of the galaxy. But the mass of a star is tiny compared to the mass of the galaxy, so we can drop the mass of the Sun. When we look at a star at double the distance from the galactic centre, we find that the mass contained within its orbit is double the mass within the Sun's orbit. However, when we look at this region, it looks like it has much less mass than this. Judging from the large circular velocity of stars far from the galactic centre, we can only see about 10% of the Milky Way's mass! It seems from the motion of stars that most of the Milky Way's mass is invisible. This dark matter seems to be distributed in a sphere around the disk of the galaxy. This sphere is called the dark halo. The only visible objects in the dark halo are a few globular clusters and a few stray stars. Neither the globular clusters nor the stars have enough mass to account for the halo's mass. Dust and cold hydrogen clouds: We know that dust blocks out light and that cold hydrogen doesn't give off much visible light. However, dust will emit infrared light, so our infrared telescopes show where the dust is and there isn't enough. hydrogen clouds emit 21 cm wavelength radio waves which we would detect if they were there. No evidence for significant amounts of dust or H in the halo. MACHOs: MAssive Compact Halo Objects = dim objects like Jupiter-like planets, white dwarfs, neutron stars and black holes. These MACHOs can account for approximately 10% of the dark matter in the halo. An example of a Weakly Interacting Particle is the neutrino. A neutrino can pass through a thousand light-years of lead before interacting with a lead atom. Hundreds of billions of neutrinos pass through every square inch of your body per second, all coming from the Sun without you noticing. Because the neutrino interacts very weakly, it is very difficult to detect. If there is some other particle similar to the neutrino, but with a higher mass, it would be a WIMP. The WIMPy hypothesis is that the dark halo is filled with WIMPs of some unspecified type. Nobody has ever detected any of these exotic particles (except for the neutrino). Stars are found with equal density everywhere in the disk. Young type O and B stars, however, are only found in the spiral shaped arms. Type O stars are about 10,000 times more luminous than the Sun, so the light from these stars dominates the picture of a spiral galaxy, making it look like a spiral. The concentration of dark dust lanes and cool molecular clouds (the birthplace of stars) is largest in the spiral arms. Hydrogen regions which glow red after being ionized by young O and B stars are mainly found in the spiral arms. Spiral arms are the sites of star formation. After being born in a spiral arm, a star moves out of the arm. Old stars (like the Sun) need not be in an arm and won't usually be found inside of their birth arm. Type O and B stars have very short life-spans, only about 1 - 5 million years, so they don't have time to move out of their birth arm. 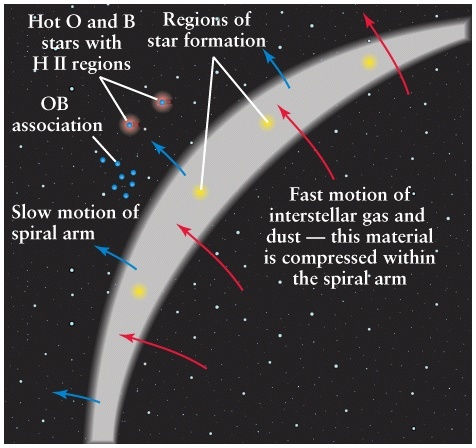 Since spiral arms are the location of star-birth, we can map the location of the arms by mapping the location of O-B stars and ionized hydrogen regions. This works for small distances (out to about 3 kpc) since the light from these objects is mainly visible light which is obscured by dust. For larger distance mapping of arms, we should look for radio waves emitted by gas in the arms which are not obscured by dust. Neutral Hydrogen and Carbon Monoxide emit radio waves. H and CO is concentrated in the spiral arms, so if we can find the distance out to H and CO clouds we can map the structure of the spiral arms. Neutral Hydrogen at rest emits a photon with 21 cm wavelength when the electron spin flips. If the Hydrogen cloud is moving within our line-of-sight, the emission line will be either redshifted or blueshifted. We can determine the radial velocity (line-of-sight velocity) of H clouds. 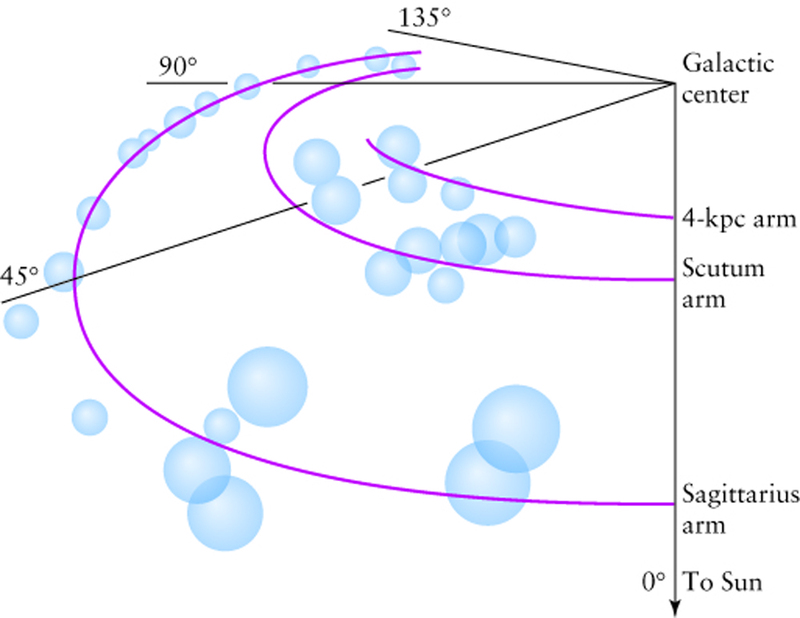 Since we already know the rotation curve for our galaxy, which tells us how fast objects orbit the galactic centre, we can use trigonometry to reconstruct the locations of the spiral arms. Reconstructions give a picture similar to the diagram below. Most stars are within a circle of radius 15 kpc from the centre. Most Hydrogen is found within a circle of radius 25 kpc from the centre. 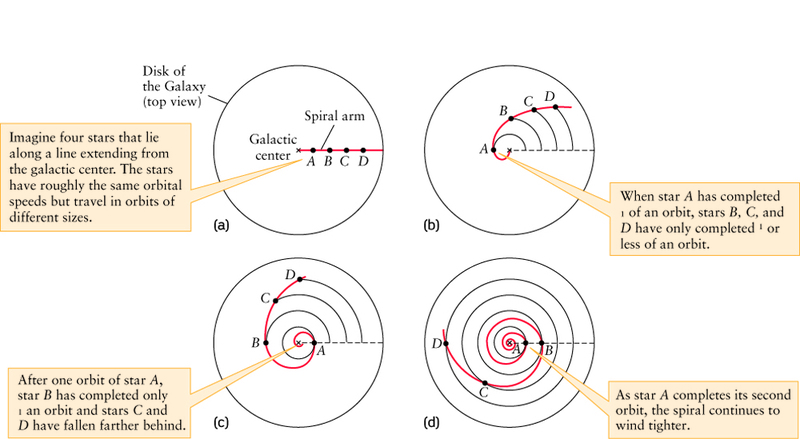 What is the origin of spiral arms in spiral galaxies ? 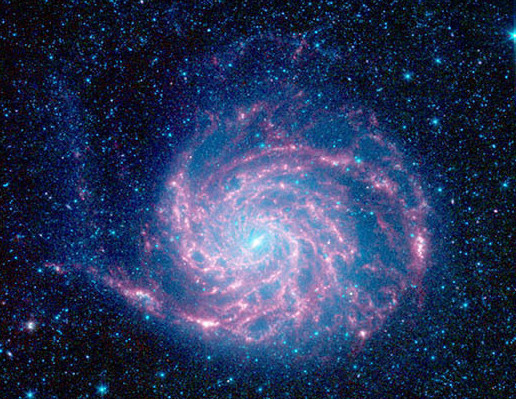 Spiral arms cannot be made from the same material throughout the galaxy history. 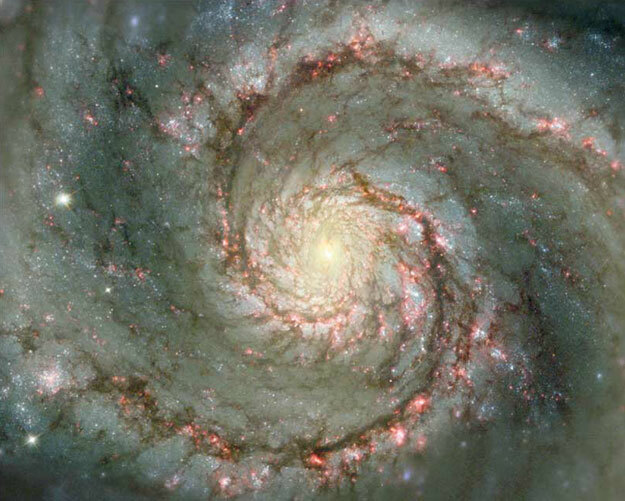 A spiral arm is just a region where the density of gas is little bit higher than average. This spiral arm is called a density wave and travels slowly in a circular motion around the galactic centre. Interstellar dust and gas move in circles at a much larger speed and collide with the density wave. When the gas enters the density wave region, it is compressed and stars begin to form. The newly born stars continue to move at fast speeds and eventually leave the spiral arm. O and B type stars don't live for long, so they never move far from their birth arm. Lower mass stars live longer and have plenty of time to move to regions between the arms. Density wave move slower than stars, so stars, dust and HI catches up from behind, but new stars are born at the front of the wave. Grand design-like spirals are result of the density waves. Much less regular, flocculent spirals may need a different mechanism. Radiation and stellar winds from first born stars compress matter around. Star formation is triggered in newly compressed regions. Bright O and B stars are short lived, so during their lifetime the spiral does not wind much, and as birght stars die, disappear from view.